When teachers asked, Bernie Sanders answered. Why, Bernie? Why did you vote this summer against everything you seem to stand for on education policy? You stood against President George W. Bush’s disastrous No Child Left Behind legislation in 2001. Why did you vote for almost the same thing in 2015? The answer is in from the Vermont Senator turned Democratic Presidential Candidate, but it’s not entirely satisfactory. In education circles, it’s a buzzword meaning opposite things to opposite people. And determined in opposite ways. Ask a representative of the standardized testing industry, and more than likely he’ll tell you accountability means making sure public schools actually teach students – especially the poor and minorities. And the only way to determine this is through repeated, rigid, standardized assessments. Let’s call that TEACHER ACCOUNTABILITY. Ask a real live educator, and more than likely she’ll tell you it means making sure local, state and federal governments actually provide the funding and resources necessary to teach students – especially the poor and minorities. And the best way to determine this is simple math. Let’s call that LAWMAKER ACCOUNTABILITY. These seem to be the central disagreements: Are lawmakers providing equitable resources to all our public schools or are teachers just not doing their jobs? Are student test scores the best way to measure accountability or should we rely on something as rock solid as elementary math? TEACHER ACCOUNTABILITY is hard to determine. You have to spend billions of taxpayer dollars buying tests, scoring tests and on test prep materials. And then you have to ignore all the evidence that this proves nothing. You could instead just poke your head into any public school across the nation and actually see teachers working their butts off. Heck! You could stop in after school hours and count the numbers of teachers still at work and tabulate the amount of their own cash they spend on class materials. But that won’t work – there isn’t an industry profiting off you using your own eyes and brain. On the other hand, determining LAWMAKER ACCOUNTABILITY is easy. Just compare school budgets. Greater than and less than. You’ll find that none of our lawmakers provide equitable funding. Rich kids in wealthy districts get Cadillac funding while poor and minority kids in impoverished districts get bicycle funding. Strangely, this is never discussed. Moreover, none of this relies on opinion. All it takes is empirical evidence to see the truth. Lawmakers are not accountable at all. Teachers are accountable for too much and judged by unscientific and untrustworthy methods. Unfortunately, few politicians have fully figured this out yet. Even you, Bernie. This summer it’s all come down to a series of votes on the Elementary and Secondary Education Act (ESEA). The law the governs K-12 public schools was written in 1965 to ensure all schools received the proper resources – LAWMAKER ACCOUNTABILITY. However, under President George W. Bush and throughout the Obama years, it’s become about punishing teachers and schools for low standardized test scores – TEACHER ACCOUNTABILITY. And the champions of TEACHER ACCOUNTABILITY this summer have been primarily Democrats including liberal lions like Elizabeth Warren and Sanders. LAWMAKER ACCOUNTABILITY? No one’s talking that. Most troubling is the Murphy Amendment – an attempt to double down on TEACHER ACCOUNTABILITY. Keep testing and punishing because it’s working soooo well. Thankfully, the move was defeated by Senate Republicans. But Sanders and Warren both voted for it. Warren even co-sponsored it! That’s why a group of respected education professionals and union leaders (including myself) wrote an open letter to Sanders asking him to please explain, himself. We aren’t exactly a hostile crowd. 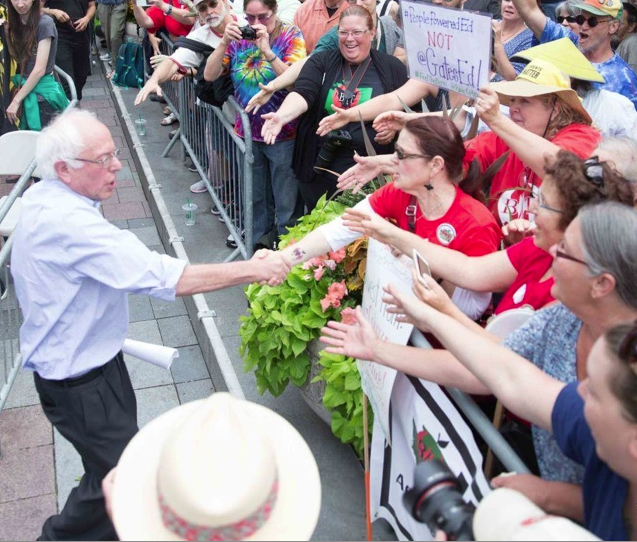 We like a bunch of things that Sanders represents in his presidential campaign. We want to support him, but we need to know why he voted to keep the worst aspects of the current law. And Bernie answered! Or his staff did. As you mentioned, Senator Murphy introduced an amendment on the Senate floor that would have required states to hold schools accountable for the academic performance of low-income, minority and disabled students. Senator Sanders voted for this amendment because he believes states must do more to protect every student’s right to a quality education, and that from a civil right’s perspective, the federal government has an important role to play in protecting low-income, minority and disabled children. As you pointed out, the mechanism this amendment would have used to identify struggling schools resembles the failed policies of No Child Left Behind. This was a significant concern to the Senator, and one that he shared with the sponsors of the amendment. Senator Sanders cast his vote on this amendment to express his disapproval with aspects of the bill that were insisted upon by Chairman Alexander and Senate Republicans and that do not reflect the best interests of vulnerable populations, or a progressive view on the distribution of education resources. He has made clear to Chairman Alexander, Ranking Member Murray, and Senate Leadership that his vote was not an endorsement of the accountability mechanism included in the amendment, but rather as a statement of his intent that other measures must be put in place to protect low-income, minority and disabled students. He was mad that there is nothing about LAWMAKER ACCOUNTABILITY in the ESEA. He believes in TEACHER ACCOUNTABILITY – at least in part. He thinks the federal government needs to make sure teachers and schools are actually educating kids, BUT he doesn’t believe standardized tests are the best way of determining this. Okay. First of all, he has a point. There is next to nothing in the whole ESEA rewrite about LAWMAKER ACCOUNTABILITY. When I was on Capitol Hill earlier this summer lobbying my lawmakers on this very issue, in general the Democrats blamed the Republicans and the Republicans changed the subject. However, I don’t see how voting for an amendment you don’t believe in is going to make a point about something entirely unrelated. How would voting for the Murphy Amendment get us LAWMAKER ACCOUNTABILITY? The Amendment had nothing to do with that. There are places for it in the ESEA but this amendment was focused almost entirely on TEACHER ACCOUNTABILITY. Was Sanders trying to convince Republicans to add LAWMAKER ACCOUNTABILITY elsewhere in the bill by voting against them on TEACHER ACCOUNTABILITY here? That seems a stretch. Both parties appear to love TEACHER ACCOUNTABILITY, but during this ESEA process the Republicans have been more concerned with stripping the federal government of its power over education. It’s not that they don’t like TEACHER ACCOUNTABILITY, they just want to leave it up to the states. Are there really schools in our country that don’t even TRY to educate their students? Really!? Are there hospitals that don’t try to heal their patients? Are there defense attorneys who don’t try to defend their clients? Are their airlines that don’t even try to get passengers to their destinations? Then we get to Bernie’s suggestion that he’s against using standardized tests to measure if schools are functioning properly. At least here he is justified. But how will voting for the exact thing you’re against get you what you want? It boggles the mind. I want Pizza, that’s why I’m voting for chicken. Huh!? However, Sanders is responsible for an innovation in the ESEA along just these lines. He proposed a 7-state pilot program that would allow TEACHER ACCOUNTABILITY to be determined on more holistic methods than test scores. Schools could use multiple measures such as student portfolios, classroom projects, or other means to be determined by the states. This could be a step forward. But even under the best of circumstances, it is limited to a maximum of 7 states. It’s not a long term solution. The majority of the country could still be stuck with test and punish. So we’re left with some good news and bad news. GOOD NEWS: Bernie actually took teachers open letter seriously enough to have a staffer answer it. That’s something. I’m sure there are plenty of presidential candidates who wouldn’t even do that much. GOOD NEWS: Bernie has some thoughtful ideas on education. His pilot program holds – limited – promise. He understands that the measures usually prescribed to determine TEACHER ACCOUNTABILITY are bogus. GOOD NEWS: Bernie acknowledges that LAWMAKER ACCOUNTABILITY is important and says he’d like to address it. BAD NEWS: He doesn’t mind focusing on TEACHER ACCOUNTABILITY when there is very little need for it. Moreover, TEACHER ACCOUNTABILITY without LAWMAKER ACCOUNTABILITY is actually harmful. Imagine if NASCAR fired a driver because the Pit Crew didn’t gas up the car. If schools have inadequate money and resources, putting a gun to all the teachers heads isn’t going to help. BAD NEWS: Some of his answers don’t make sense. BAD NEWS: He isn’t addressing us personally. Will it take teachers storming his campaign speeches and swiping the microphone before he does more than limited reforms and pays us lip service? It’s one thing to say #BlackLivesMatter. It’s another to make sure our black and brown kids get an equitable education. Senator Sanders has asked me to respond to your email, and share his views on the Every Child Achieves Act, standardized testing, and school accountability. As you know, Senator Sanders has long opposed the blame-and-shame approach to school accountability embodied in No Child Left Behind. He voted against No Child Left Behind in 2001 because he believed then, as he does now, that the legislation’s narrow focus on standardized test scores ignores a broad range of factors that determine how well a school is meeting the needs of its students. Since the passage of this legislation, we have seen the devastating impact that high stakes standardized testing has had on schools all over the country. In the Senator’s home state of Vermont, nearly every school is identified as “failing,” and is threatened with increasingly proscriptive federally-determined interventions. No Child Left Behind’s narrow focus on standardized test scores has tragically led to a significant culture shift in our nation’s schools. An obsession with testing and test preparation has taken over in countless school districts in America, and educators are being forced to dedicate hours of class time getting students ready for exams rather than teaching them new material, or strengthening essential skills and qualities like critical thinking, teamwork, and problem solving. And the worst thing is that students from low-income, urban school districts spend more time in test preparation than students from the suburbs. These hours and hours of test preparation have no educational value, and the fact that poor and minority students are disproportionately subjected to test prep at the expense of lesson time is a huge problem that must be addressed. Last month, the senate passed the Every Child Achieves Act, which would fundamentally reform No Child Left Behind, and end its system of high stakes testing and draconian interventions. Senator Sanders supports this legislation, and believes it represents a very important step forward. As a member of the Senate Committee on Health, Education, Labor and Pensions, the Senator had an opportunity to shape this legislation at every stage of its development. For example, he was one of the leading advocates on committee for the inclusion of a “multiple measure” accountability system that allowed states to include factors other than test scores when determining a school’s effectiveness. In addition, he worked to provide states with significant flexibility when it comes to assessment. This legislation includes a provision written by Senator Sanders that would create a groundbreaking alternative assessment pilot program which would allow states to implement alternatives to standardized testing. If the legislation passes, these new assessments would eventually reduce the number of statewide tests children are forced to take, while providing educators with timely information on student performance. However, this legislation is far from perfect, and there are several aspects of the Every Child Achieves Act that have caused the Senator great concern. For example, there is no requirement that states focus resources or attention on schools that are meeting the needs of middle class children, but not meeting the needs of minority, low-income and disabled children. In addition, the Senator is concerned that the bill does nothing to address resource equity, and was deeply disappointed when an amendment offered by Senators Kirk, Baldwin, Reed and Brown to address resource equity failed on the Senate floor. As congressional leaders move toward the next step in consideration of this bill – negotiating differences with the House – Senator Sanders has urged the future leaders of the conference committee to include protections for low-income, minority and disabled students, and to do so in a way that addresses the needs of the whole child. We must ensure low-income, minority and disabled children have the same access to educational resources that their wealthy suburban peers have. In addition, we must ensure that struggling students have access to adequate supports including health, mental health and nutrition services and after school programs that help level the playing field. For many years, educators across the country have been the loudest, strongest voices against the corporatization of our nation’s education system and for the increased funding and wraparound services that will make a difference for our children. This is a fight that Senator Sanders has been waging at the national level for 25 years, and one that he will continue to pursue.